What a history The Beverly Hills Hotel has had. So many Hollywood legends stayed and played there it became a legend itself. 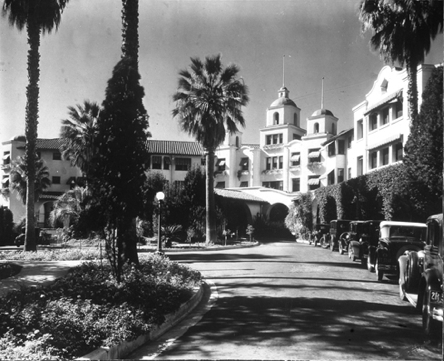 In 1912 the hotel was built for $500,000 in the bean fields at the foothills of the Santa Monica Mountains, halfway between Los Angeles and the sea. The city of Beverly Hills developed around the property on Sunset Boulevard and Crescent Drive, incorporating two years later. With newlyweds Mary Pickford and Douglas Fairbanks taking up residence nearby in 1920, the Hollywood community began moving in. Charlie Chaplin, Buster Keaton, Rudolph Valentino, and Tom Mix built fabulous homes in the area. Gloria Swanson stayed there during a divorce, before relocating to a mansion across the street. Movie stars took advantage of the hotel’s accommodations. Following polo matches at Will Rogers’ ranch, Clark Gable, Spencer Tracy, Gary Cooper, Tyrone Power, Walt Disney, and Darryl Zanuck imbibed at its bar, hence, the name the Polo Lounge. Humphrey Bogart and the Rat Pack later followed suit. The pool was another favorite hangout. George Hamilton cultivated his tan, while Fred Astaire read the industry rags poolside. Faye Dunaway learned the crawl for her role in Mommy Dearest. Others just relaxed or socialized. A veritable who’s who in entertainment included Cary Grant, Lucille Ball, Esther Williams, Johnny Carson, Merv Griffin, and Carol Burnett. The pool was opened late one night when the Beatles wanted to take a dip. And then there were the famous bungalows. Marilyn Monroe preferred numbers 1 and 7. Howard Hughes stayed off and on for thirty years in Bungalow #4. Elizabeth Taylor and Richard Burton frequently occupied Bungalow #5, with a standing order for two bottles of vodka at breakfast and two more at lunch. That certainly juiced up the tempo. So what becomes a legend most? The perfect location, fun in the sun, beautiful people, and a touch of mink. Celebrating its centennial this year, the hotel is rolling out the red carpet for all its guests. In its promotional literature it promises “every visitor to ‘The Pink Palace’ is pampered like a celebrity.” It’s just not likely that you’ll bump into a real celebrity. They’ve moved on to the next hot spot. My best friend Christoph is the General Manager there. He also oversees the belair hotel. These hotels have so much class and history!! Thanks for sharing this Susan! I don’t know if he is important, but he’s a really great guy:0) Did you see my post of the day? I am really proud of it! It was so delicious: French Onion Soup!! !